Under the wide array of our offerings, we have brought forward Taffeta Satin Labels for our esteemed clientele. These labels are designed & manufactured using sophisticated technology and are characterized by low thread density. 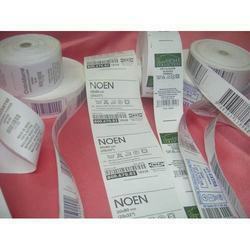 These qualitative features make our offerings to be of utmost usage as price tags or product information labels. We offer these labels at reasonable rates. We, Ganeesha Enterprises, established our operations in the year 2006, as one of the leading manufacturers, importers, traders, exporters and suppliers of an extensive compilation of Labels, Stickers and Corporate Gift Products. Our product assortment comprises of Jewelry Labels, Stickers and Labels and Woven Labels that are provided in customized specifications to meet the numerous requirements of our esteemed patrons. Further, we are also engaged in offering Printing Services to our clients. Since our inception, we have focused on proffering the best quality possible and to make sure of the same, optimum quality raw materials are used for the manufacturing process. Our company is backed by a magnificent infrastructure that is provisioned with modern and advanced technology based machines and equipment. Furthermore, we have hired an experienced and skilled team that works hard to cater to the various requirements of the clients. Owing to the large production capacity, we have been successful in fulfilling the bulk demands in the market as well. We are immensely famous in the market for our customized solutions and customized packaging that we proffer for our product assortment. We export our products in U.S & European Countries and Import from China.